Recorded at Katzman Contemporary (Channel no. 1: Vlog), January 12, 2016. 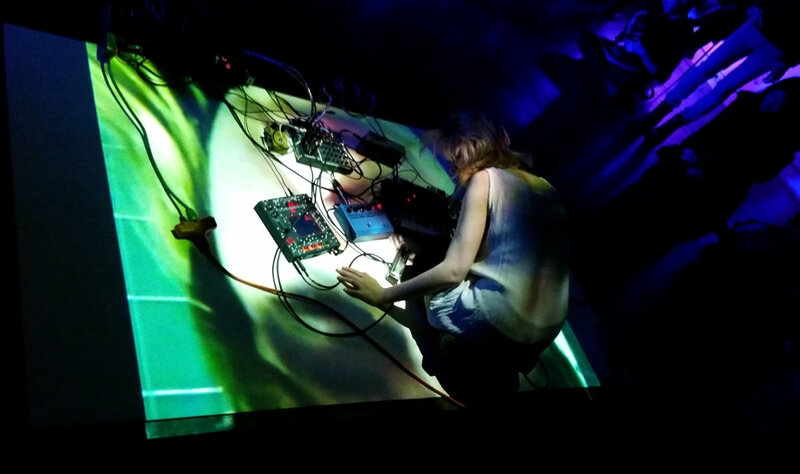 This five-night series, curated by Brett Despotovich, is bringing Toronto's experimental music scenes into a gallery space — both to allow some considered listening and to enable a series of large-scale visual collaborations. (This first night drew inspiration from the seemingly-boundless wellspring of youtube videos.) Besides the well-chosen music, this will also be an introduction for many to a rather lovely space — gallery culture, which tends to stay one step ahead of gentrification in the search for affordable spaces, has now seeped up to Carleton Village. So this week, hop on the Symington bus and go check out some cool collaborations. The most elaborately-conceptualized of the evening's performances, Kristel Jax found the ideal visual counterpoint to her intimately-murmured drone-pop. Projector pointed straight down onto her performance space on the floor in the middle of the room, she was painted by a series of confessional video diaries, their emotional talkbursts creeping into the corners of her soundscapes. The operatic intensity of these private moments corresponded to the vocals, which seem to be simultaneously lay-it-all-out confessional and (via echo and other sonic manipulations) murkily opaque — our private crises laid bare for all to see, but still the incomprehensible mumblings of an existential Other. * Thanks to Kristel for passing along the title to this one.